Many patients complain of postnasal dripping. 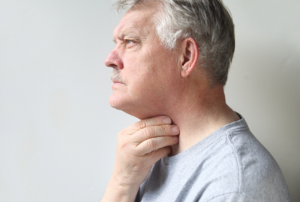 Most people perceive this as a sensation of mucus buildup in the back of the throat. The majority of the patients point to the different parts of the neck and the throat area as the center of their discomfort. Various patients also feel sensation of a ball being stuck in the back of the throat or feeling of discomfort with swallowing or symptoms with speaking or breathing. A significant number of patients with self-described symptoms of postnasal dripping actually deny any specific nasal or sinus symptoms such as congestion, runny nose, difficulty breathing, allergies, or recurrent sinus infections. The area in the back of their throats, the same area that most people refer to as a center of the postnasal dripping, can be the receiving end of secretions from various organ systems. The obvious organ system could be the nose and sinuses. In patients with an upper respiratory infection, allergies, cold, or sinusitis, the secretions can then drip down in the back of the nose and land in the throat. This can create very sticky secretions which the patients feel a great deal of discomfort trying to alleviate. By addressing the nasal symptoms directly, the dripping could be reduced, and the sensation of postnasal dripping can be significantly improved. Many patients use nasal saline irrigation as well as various prescription nasal preparations and antibiotics that are appropriate in each individual case. Most patients with dripping in the back of the nose that is actually from nose and sinuses do have significant amount of nasal symptoms that are obvious. It is rare to have true postnasal dripping with no obvious nasal and sinus symptoms. Other organ systems can also affect the back of the throat. One of them could be the lungs and trachea. In patients suffering from chronic asthma, chronic bronchitis, pneumonia, or various lung symptoms, the secretions can come up and land on the back of the throat. These patients typically complain of incessant cough, difficulty breathing, asthma-like symptoms, and chronic secretions. These secretions also tend to be more productive, and they can present as yellow or green secretions. Many patients with either asthma or pneumonia-type symptoms are also significantly symptomatic in addition to the sensation of postnasal dripping. A third organ system that can give a sensation of postnasal dripping is actually the stomach. Our stomachs make a quite bit of acid on a daily basis to digest our food. We have various protective mechanisms to keep the acid down in the stomach and prevent from regurgitating back through our esophagus into the back of our throats. However, in certain patients with acid reflux this can result in a sensation of something not being quite right in the back of the throat. Some patients complain of a feeling of globus (as though a ball is stuck in the back of the throat). Other patients describe raspiness of the voice, difficulty breathing, waking up several times in the middle of the night with cough, and a feeling of not being able to alleviate something sticky in the back of the throat. The kind of reflux that gives many people a sensation of postnasal dripping could actually be what is called silent reflux. This has to do with the protective mechanisms and how much they can protect us before we actually develop symptoms in our stomach area. It is thought that our protective mechanisms allow enough relief for us to have up to 50 episodes of reflux per day before we feel anything. If the patient experiences more episodes of reflux than that, we start having symptoms of heartburn. However, certain patients in whom the acid reaches the back of the throat where there are no protective mechanisms feel a discomfort much sooner. The treatment for these patients usually centers on diet modifications to comply with reflux guidelines, antacid medications, and gargling on a regular basis with salt and water. Patients with postnasal dripping would be best served by seeing their specialist to examine all options. Once the exact sources of the symptoms are found, the appropriate treatment protocol can be prescribed. My cough is of a totally different description than mentioned; I feel as if the epighlottis is not protecting the entrance to my trachea, thus allowing saliva, post nasal drip,fluid, food (chewed and unchewed) water- any thing else in my throat- to enter into my lungs. My fear is developing pneumonia, as I did last year, I feel, from these same symptoms,(inability to breathe in or out, coughing to relieve symptoms of a feeling of phlegm running down Into that one spot In my throat, gagging on excess mucosy saliva, choking to breathe as I’m eating or speaking. as I mentioned above. It seems that you have done a good amount of investigating and treatment for this condition. You seem very knowledgable. Rather than giving you guesses, you are best served by being examined and also review any test or imaging results before making any more changes. If you happen to be in NYC, I would love to look into this with you. And when considering the stomach, consider Candida. It caused my decade of throat clearing and miserable morning hacking and choking. I went on a candida diet and took oil of oregano for a month and now phlegm free. I look at candy, cookies and alcoholic drinks differently now. I have gone through a slough of testing for my post nasal drip, fatigue and muscle pain and it seems none of these three main reasons aforementioned above in the article are causing my post nasal drip/ drainage, after looking at photos from various sufferers of Candida infections I have come to the conclusion that I may be suffering from a fungal infection. Would it be ok if I emailed you with more questions? Thank you for your interest. At the present time my office is not set up to carry out tele-medical consultations. I am an 18yo male. I have been suffering from a sore bumpy throat for months now. I believe i have narrowed the cause down to irritation caused by post nasal drip. However, my nose seems to be completely normal most of the time. I am swallowing mucus most of the day. I am confident it is mucus and that it is coming from my nose. How can this be if i have no nasal symptoms? On top of that, what should i do to alleviate my symptoms? Your time and responses are appreciated. Not all post nasal dripping is from the nose, as the article suggests. You are correct to doubt the nose if there are not enough nose and sinus symptoms. Your best bet is to have a thorough exam to identify the source. Do you know of any doctors in the Phoenix area who are knowledgeable in your field. I think I’m going to die. Im taking omeprazole for GERD, allergy medicine, sinus medicine, etc. I need to figure this out because I can’t live like this, coughing and struggling for oxygen. It does feel like post nasal drip is somehow sneaking into my lungs. When I breathe I wheeze and gurgle. Ive had this going on 4 years. Last year I had a 4 month bout of laryngitis because of this. I desperately want to enjoy life. I baffle all doctors I’ve seen, from Pulminologists to allergists to an ENT specialist. Ive had to go to emergency room because I was suffocating in my own juices. Please recommend someone in Phoenix. As I said, I baffle all doctors I see, and being treated for a variety of ailments all causing these horrible symptoms. Thank you so much for your advice. I am so sorry, but I have no network of doctor in your area I know personally and would recommend. I ve been suffering for 2 years and nothing helped.The only symptom that I have is post nasal drip…nothing more…..no runny nose,no cough,no pain,no allergy symptoms.Recently,I had a surgery on 28th March (septoplasty and turbinate reduction).1month and 2 weeks and here I am searching for a cure for my post nasal drip.Im so desperate cause I really thought Im gonna get rid of it if I do the surgery.A few months ago I ve done an allergy test and also the doctor looked in my stomach.With all being said,I figured out that I dont have any silent acid reflux and allergies so Im asking you,if I dont have allergies,acid reflux,sinus infection,no symptoms what could cause this post nasal drip thats destroying my life? I have sympathy for everything you have gone through. As you see yourself, what we label as “post nasal drip” could be very challenging to both the patients and the doctors trying to solve the problem. These secretions could be from the nose, the stomach, or the lungs. Alternatively, some people do have an issue with the texture of their mucus and have more difficulty handling the secretions. Hydration and use of Mucinex could also come in handy. I have a hard time swallowing food and they said I have cobble stones in the back of my throat with post nasal drip and a little bit of gerd my neck feel tightness at all times and I have a bit of anxiety it’s very discomforting. I also feel like my nose is stuffy and can’t. Breathe from my nostrils I also have a little bit of asthma. Do you know of any good doctors in Washington state? I’m sorry, I don’t have any network of colleagues in your area I am familiar with. However, University of Washington is surely a good resource. I am a 33 year old male that just underwent and endoscopy. I was diagnosed with Gerds. I am on 60 mg of pantaprozole and 40 mg of pepcid. I feel like I have drainage in the back of my throat and sometimes feels there is a lump in the back of my throat. Do you think that this is caused by my Gerds, or that I might have Silent Reflux. I feel that going to a Gastroenterology has not alleviated my problems. Would an ENT be able to diagnose me better and can they do so without sticking a catheter up my nose> ( I have a fear of chocking and really want to avoid that procedure. Any time you have a funny feeling in the back of the throat, the area should be examined directly with a flexible laryngoscope to assure there are no masses. Often GERD or LPR can be diagnosed or confirmed at the time of endoscopy. Dr. ~ I’m a 73-year-old male. Well over ten years ago I was seen by an ENT specialist for what I described as a mass feeling in the back of my throat near by adams apple. I would feel this sensation only when I swallowed. The specialist found no problems at the time other than acid reflux and put me on Nexium. It became less pronounced, but never totally went away. I just got used to it and learned to live with it. Fast forward to the present where I find myself being bothered by it again much more pronounced and complicated by constant post nasal drip that I find myself constantly snorting to try to clear it from my sinus area. I can feel the build up around the top of my throat and my ears and nose. It doesn’t affect my breathing, drinking, eating, sleeping or any other part of my waking life. There is no pain, hoarseness or voice complications. I should add that sometimes I’m much more aware of it than others, but none the less, it’s an annoyance that’s driving my bonkers. I was going to put off attention to it until I have my annual physical in a couple of months, but do you think I should attend to it sooner? Reflux can have a cyclical patter: Occasially it bothers you more, and occasionally it improves either because of you did as an intervention or just pure luck. However, you can’t always assume that the same exact problem from 10 years ago is what is happening now. Your best bet is to have the area examined and get the right treatment. I am 35 year old male.I have a case where my nasal mucous membrane seems oversensitive. I have a post nasal drip whenever I speak fast, laugh or eat. something stimulating. There was a time when I eat spicy foods 2 years ago in consecutive days and my nose was really sensitive and my tongue felt burned. and having post nasal drips all day long. At the present I don’t feel fully healed since it is not hundred percent back to normal. I have tried Triprolidine, Pseudoephedrine and methylprednisolone with no effect. I have done nasal endoscopy for many times but still the doctors could not figure it out what is the problem. What is the name of this case ? Is there anything you could recommend to me ? Not having had the chance to examine you, it seems you might possibly have vasomotor rhinitis. Kindly consult your local ENT to see if this diagnosis makes sense for what you have and if we can treat if for you. Many people might suffer from post nasal drip that is not due to allergies or sinus issues we can see. It can even be from acid reflux disease, or from lung secretions. If nothing else is found, there are medications and minor procedures to slow down the mucus glands. I get viral infection which leads to post nasal drip and bronchitis . My CT scan shows right sight septal deviation although i dont have any breathing . Many people believe that from the tip of our nose down to the very bottom of our lungs is all one organ. Any condition of the nose and sinuses can also affect the bronchus and lungs, and vice versa.